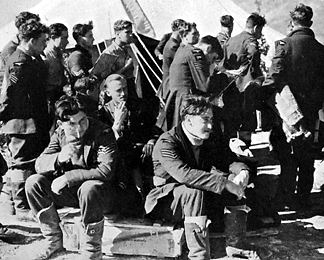 With minor changes in wording, war correspondent Tommy Wisdom later used this story of his time in Greece with 211 Squadron as a chapter in Wings Over Olympus. My father long remembered the article itself, remarking “they wrote a story about us, you know”. It took a long time to find. Hardly surprising that, 60 years after the event, my father misremembered which magazine. Sending me first to the Illustrated London News and then to The Tatler, later it seemed that The Sphere piece was the one he meant, with its somewhat larger selection of photographs. 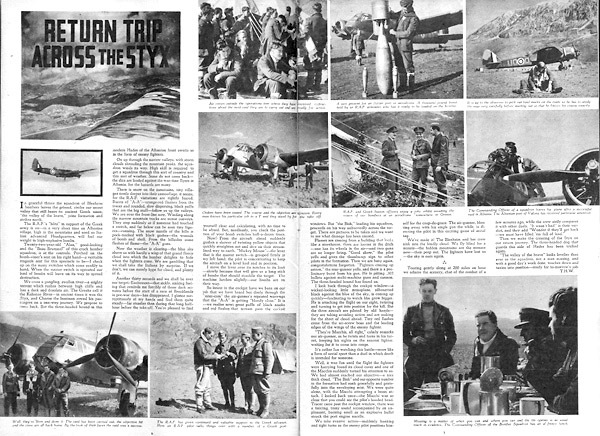 A chance encounter with a militaria and magazines dealer at a local trash-and-treasure market one hot summer morning, a visit to the National Library of Australia, and at last the original issue was run to earth. As a war-time Services magazine, Parade Middle East Weekly was quite upbeat and, if austere in production quality, reasonably stylish. The Cairo sub-editing too was pretty fair, though readers with sharp eyes will blink once or twice at usage. Here is the whole story as first published by Parade in March 1941, with its wonderful collection of photographs. Given the time and place, a light cloak of secrecy has been deftly flicked over Paramythia, Valley of Legends, to become, just as aptly, Valley of the Brave. While a number of the images were subsequently published in Wisdom’s book and elsewhere, many others were fresh. Where a better quality copy was available I have used it. Article text and captions as originally published. Added remarks as [shown]. 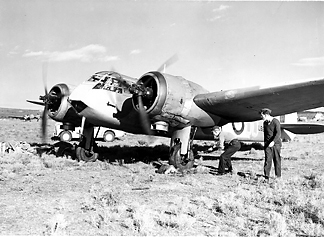 In graceful threes the squadron of Blenheim bombers leaves the ground, circles our secret valley that still bears its ancient Greek name, "the valley of the brave," joins formation and strikes north. 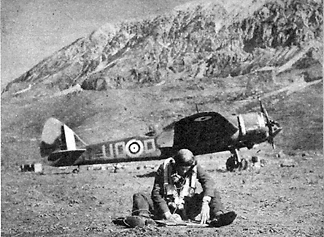 The RAF's "blitz" in support of the Greek army is on—in a very short time an Albanian village, high in the mountains and used as Italian advanced Headquarters, will feel our weight in high-explosive bombs. Twenty-two-year-old "Alan," good-looking and the "Beau Brummel" of this crack bomber squadron, is at the controls. Perched on the bomb-aimer's seat on his right hand—a veritable ringside seat for this spectacle to be—I check up on the many switches which come readily to hand. When the master switch is operated our load of bombs will leave on its way to spread destruction. We cross a gangling, swollen river—a mighty torrent which rushes between high cliffs and has a dark and desolate air. The Greeks call it the Kalamas River—in ancient times it was the Styx, and Charon the boatman rowed his passengers on a one-way journey. We propose to come back. But the three-headed hound in this modern Hades of the Albanian front awaits us in the form of enemy fighters. On up through the narrow valleys, with storm clouds shrouding the mountain peaks, the squadron winds its way. High skill is required to get a squadron through this sort of country and this sort of weather. 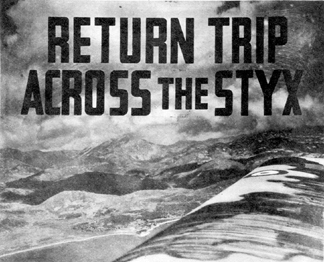 Some do not come back—the dice are loaded against the war-time flyers in Albania, for the hazards are many. There is snow on the mountains, tiny villages nestle deeper into their camouflage, it seems, for the RAF visitations are rightly feared. Bursts of "A-A"—orange-red flashes from the tracer and rounded, slow dispersing, black puffs that are the big stuff—follow us up the valleys. We are over the front-line now. Winding along the narrow mountain tracks are motor convoys. They stop suddenly as if someone had touched a switch, and far below can be seen tiny figures—running. The snow mantle of the hills is pock-marked with black gashes—the wounds of bomb and shell. From the hillsides come flashes of flame—the "A-A" guns. Now the weather is clearing—the blue sky above us with hardly a wisp of that grand fleecy cloud into which the bomber delights to hide when the fighters come. We are gambling that we shall take the Italians by surprise. If we don't, we can merely hope for cloud, and plenty of it. Another thirty seconds and we shall be over our target. Excitement—that sickly, sinking feeling that reminds me forcibly of those dark minutes before the start of a race at Brooklands in pre-war days—has disappeared. I glance surreptitiously at my hands and find them quite steady—far steadier than during that long half-hour before the take-off. You're pleased to find yourself clear and calculating, with no time to be afraid. But, needlessly, you check the position of your bomb switches half-a-dozen times. Now! From the aircraft ahead suddenly gushes a shower of twisting yellow objects that quickly straighten out and dive on their streamlined way to earth. "Mickey Mouse"—the lever that is the master switch—is grasped firmly in my left hand; the pilot is concentrating to keep the aircraft on a level keel and in position. I move the lever over its notches to its limit—slowly because that will give us a long stick of bombs that should straddle the target. The machine lurches slightly—our bombs are on their way. So intent in the cockpit have we been on our job that we have heard but dimly through the "inter-com" the air-gunner's repeated warnings that the "A-A" is getting "bloody close." 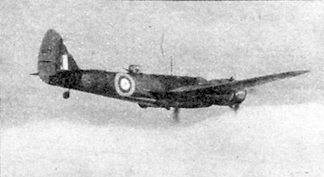 It is—we realise now; great puffs of black smoke and red flashes that scream pass the cockpit windows. But "The Bish," leading his squadron, proceeds on his way unhurriedly across the target. There are pictures to be taken and we want to see what damage has been caused. Flames are coming from a building that looks like a storehouse, there are lorries in the ditch—one has its wheels in the air—and two guns are no longer firing. "Good show," the pilot yells and gives the thumbs-up sign to other pilots in the formation. Then we are busy again, congratulations forgotten. "Fighters coming up astern," the rear gunner yells, and there is a preliminary burst from his gun. He is pitting .303 bullets against multi-machine guns and cannon. The three-headed hound has found us. I look back through the cockpit window—a wicked-looking little monoplane, silhouetted black against the blue of the sky, is coming up quickly—fascinating to watch him grow bigger. He is attacking the flight on our right, twisting and turning to get into position for the kill. But the three aircraft are piloted by old hands—they are taking avoiding action and are making for the sheet of cloud ahead. Tiny red flashes come from the air-screw boss and the leading edges of the wings of the enemy fighter. "They're Macchis, all right," calmly remarks our air-gunner, as he twists and turns in his turret, keeping his sights on the nearest fighter, waiting for it to come into range. It's rather fun watching this battle—more like a form of aerial sport than a duel in which death is intended for someone. Well, it was fun until the flight the fighters were harrying found its cloud cover and one of the Macchis suddenly turned his attention to us. We had almost reached our objective—a nice thick cloud. "The Bish" and our opposite number in the formation had sunk gracefully and gratefully into the enveloping mist. We were quite alone, with the Macchi attempting a beam attack. 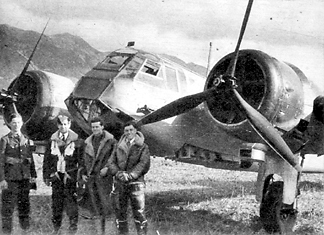 I looked back once—the Macchi was so close that you could see the pilot's hooded head. Tracer came past the cockpit window, there was a tinkling, tinny sound accompanied by an unpleasant, burning smell as an explosive bullet struck the port engine nacelle. We take evasive action—suddenly banking and tight turns as the enemy pilot positions himself for the coup-de-grace. 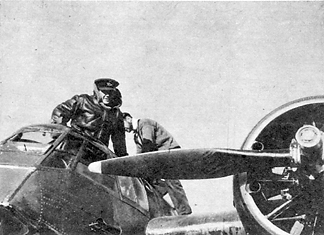 The air-gunner, blasting away with his single gun the while, is directing the pilot in this exciting game of aerial tag. We've made it! The Blenheim and her crew sink into the kindly cloud. We fly blind for a minute—the hidden mountains are the menace now—then peep out. The fighters have lost us—the sky is ours again. Touring gently along at 200 miles an hour we admire the scenery, chat of the combat of a few minutes ago, while the crew airily compares it with other duels. "It wasn't bad" is their verdict, and they add "Wonder if they'll get back—we must have filled 'em full of lead." Then we make the crossing of the Styx on our return journey. The three-headed dog that guards this side of Hades has been tricked again. "The valley of the brave" looks lovelier than ever as the squadron, not a man missing, and with a good day's work done, touches down and taxies into position—ready for to-morrow's job. A nice present for an Italian port or aerodrome. 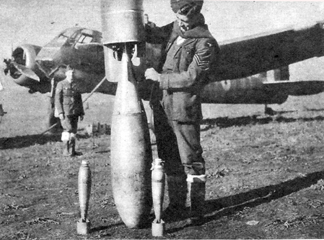 A thousand pound bomb held by an RAF armourer who has it ready to be loaded on the bomber. It is up to the observer to pick out landmarks on the route so he has to study the map very carefully before starting out so that he knows his course exactly. The commanding officer of a squadron leaves his plane after a successful raid in Albania. The Albanian port of Valona has received particular attention. 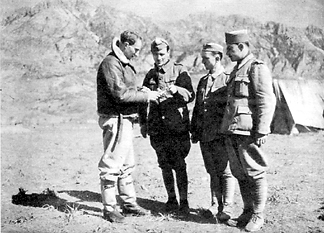 The RAF has given continued and valuable support to the Greek advance. 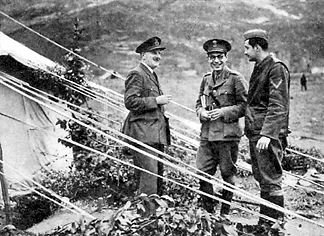 Here an RAF pilot talks things over with a member of a Greek post. RAF and Greek liaison officers enjoy a joke whilst awaiting the return of our bombers at an aerodrome somewhere in Greece. Messing is a matter of when you can and where you can and the tin opener is as usual much in evidence. 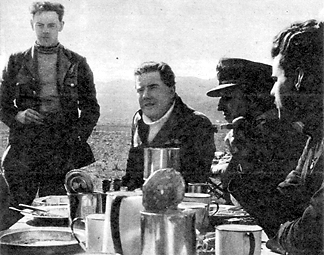 The Commanding Officer of the Bomber Squadron has an al fresco lunch.